President Beth Stroble and Provost Julian Schuster invite St. Louis-area faculty and staff to celebrate the holiday season with good friends and good cheer, Friday, Dec. 7, from 4-5:30 p.m., in the Edward Jones Commons of the East Academic Building. In the spirit of the season, guests are invited to bring monetary or donations for Affton Christian Food Pantry to the party, for collection. To celebrate the rich diversity of Webster’s worldwide network, a uniquely decorated Global Holiday Tree will be on display in Loretto Hall throughout the month of December. Please bring your ornament to the Global Holiday Tree Trimming Party on Nov. 28, in Loretto Hall, outside of Marletto’s Marketplace. Refreshments will be served. Those at extended campus locations are also invited to mail ornaments for the tree. 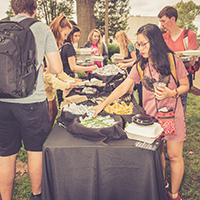 Webster University's Gorlok Gathering brought students, faculty and staff together to celebrate the beginning of fall semester on Aug. 30. Held just outside Maria Hall, attendees were treated to grilled food, salad and desserts. It is that time of the year again! National Student Employee Appreciation Week is April 9-13. This is Webster University’s opportunity to honor student workers, supervisors, and individual offices for all of the great work they do. Please take the time to nominate individuals in order for them to get the recognition they deserve. Nominations are open until April 4. 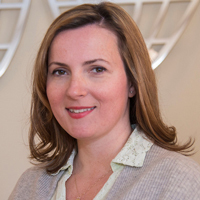 Please join the Academic Resource Center for a farewell reception for Sanela Bejdic, Testing Center coordinator, on Wednesday, Dec. 13, at 3 p.m. in the Academic Resource Center. Bejdic is leaving the University, effective Dec. 20, and will be embarking on a new career as the manager of the assessment department at St. Louis Community College – Forest Park. 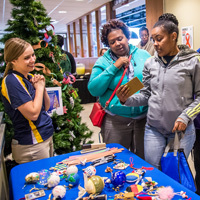 In celebration of the rich diversity of Webster University’s worldwide network during the holiday season, a uniquely decorated Global Holiday Tree is on display in Loretto Hall, outside of Marletto’s Marketplace throughout the month of December. New ornaments submitted from around the Webster worldwide network are added to the permanent collection that decorates the tree each year. On Nov. 29, faculty, staff, alumni and students kicked off the season with a Tree Trimming Party. Webster University’s Office of Military Affairs (OMA) and Student Veterans Organization (SVO) will host the sixth annual Military Appreciation Breakfast on Friday, Nov. 10, from 8-9 a.m., honoring the military service of Webster students, faculty and staff. 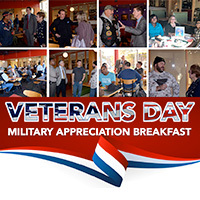 St. Louis-area veterans, military students and their families are invited to enjoy a free breakfast at Marletto’s Marketplace, along with camaraderie and fellowship with the OMA team and SVO members. President Beth Stroble and Provost Julian Schuster invite faculty and staff to celebrate the holiday season with good friends and good cheer at this year's President and Provost's Faculty and Staff Holiday Party on Friday, Dec. 8, from 4-6 p.m., in the Edward Jones Commons, East Academic Building. In the spirit of the season, guests are invited to bring monetary donations for Saint Louis Effort for AIDS. On the behalf of the Webster Wellness Committee, we are pleased to announce that St. Luke’s Mammography van will be here, at Webster University on Wednesday, September 20, from 8am-1:30pm. The event will take place in Parking Lot G (across from the Parking Garage/Bookstore). To sign up, call St. Luke’s scheduling at 314-205-6267, option 1. The University Bookstore begins summer hours on May 26 (Monday-Thursday, 7:30 a.m.-6 p.m.; Friday 7:30 a.m.-3 p.m; closed Saturday and Sunday). Normal business hours will resume Aug. 7, 2017. There will be a Committee to Review Faculty informational meeting for faculty members to petition for initial status (FDL or tenure) and/or promotion in the 2017-2018 academic year or planning to do so in future academic years. This meeting will be held in the Library Conference Room on Monday, May 15 from 10-11 a.m.
President Beth Stroble and Provost Julian Schuster invite faculty and staff to celebrate the holiday season with good friends and good cheer, Friday, Dec. 9, from 4-6 p.m., in the Edward Jones Commons, East Academic Building. Donations for Food Outreach, Inc. will also be accepted at the party. 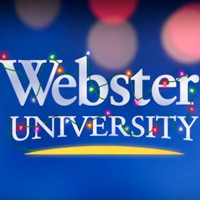 To celebrate the rich diversity of Webster’s worldwide network, a uniquely decorated Global Holiday Tree will be on display in Loretto Hall throughout the month of December. Please bring your ornament to the Global Holiday Tree Trimming Party on Wednesday, Dec. 7, 10:30-11:30 am. in Loretto Hall, outside of Marletto’s Marketplace. Refreshments will be served. Those at extended campus locations are also invited to mail ornaments for the tree. The Gorloks Going Green (G3) Sustainability Peer Educators will host a Donation Collection and Swap Shop the week of Oct. 24. Bring your gently used items to either the University Center, Marletto’s Marketplace or West Hall for donation collection Oct. 24-27. On the Friday, Oct. 28, the G3 Educators will host a Swap Shop in Sunnen Lounge from 11 a.m.-2 p.m.